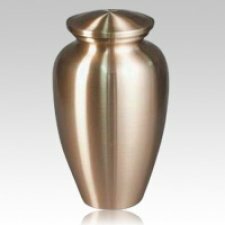 The Degean Bronze Cremation Urn is made from bronze and designed with a classic style that will outlast the ages. Bronze is widely considered an ideal material for cremation urns because of its unique strength and beauty. This urn is of a design reminiscent of the classic models of ancient Greece.